"... entranced the audience with his finely honed touch culture and emotional depth. Whether Grieg, Mendelssohn or Chopin - the musical conversation radiated a zest that nobody could resist." This is what the "Rheinische Post" wrote about the pianist Michael van Krücker. Numerous successes in international music competitions as well as important scholarships have supported his concert activities and have taken him through many countries in Europe, to Asia, South America and the United States in recent years. Numerous guest performances at major festivals (Schleswig-Holstein Music Festival, Heidelberger Frühling (Germany), Festival de la Roque d'Anthéron (France), Pomeriggi Musicali (Italy), Julius Röntgen Festival Den Haag (Netherlands)) as well as his performances with famous orchestras (the Gürzenich Orchestra/Cologne Philharmonic, the Cologne Radio Symphony Orchestra, the Bamberg Symphony Orchestra, the Capella Cracoviensis (PL) and Het Gelders Orkest (NL)) have helped him to achieve an international reputation. His concerts and recordings as a soloist and chamber musician as part of the Cologne Piano Duo all meet with enthusiastic receptions from audience and press alike. The artists were also honoured in the "American Record Guide" by one of the world's greatest authorities on piano music, Harold C. Schonberg, who praised "their excellently interpreted program" and "the great enthusiasm with which they played". Critics unanimously praise his "faultless jeu perlé" (Berliner Morgenpost), his "extremely refined performance" (Rotterdams Dagblatt) and his "poetic music, rich in nuances" (Basler Zeitung) when he played solo. Another area is also performing music on period instruments. For the label NCA he has recorded several CDs on French pianofortes of the romantic era that have been considered by the critics with the highest praise. Michael van Krücker also has a preference for the connection of words / texts and music. Together with actors like Christoph Bantzer, Hans-Jürgen Schatz, Peter Matic, Peter Fricke and Chris Pichler he shows his special affinity for it in readings and recordings, he even recorded a CD with Will Quadflieg. 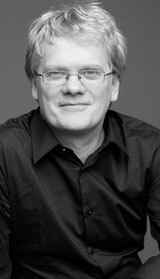 Michael van Krücker has been member of a jury in national and international music competitions, gives master classes in Germany and abroad as well as lectures. He is the artistic director of several concert series as well as the artistic advisor of the First International Jörg Demus Festival 2017 in Freiburg/Breisgau. In addition, he frequently participates in radio and television broadcasts and has recorded numerous CDs for RCA Red Seal, Sony / BMG, Koch Schwann, Berlin Classics, NCA and NM Classics. Among them are many world premiere recordings. He has primarily focused on making the forgotten repertoire of the classical and romantic eras accessible again to a wider audience. Michael van Krücker has recorded piano music of Alexander Dreyschock (1818-1869), Friedrich Kalkbrenner (1785-1849) and, for the first time recorded on CD, the complete works of Friedrich Nietzsche (1844-1900) which he presented to a wider audience in the University of Oxford on the occasion of the 17th International Conference of the Friedrich Nietzsche Society. During the 2013 Bayreuth Festival Michael van Krücker performed a Nietzsche recitation evening. Another field of activity is the editing of piano works. For the publishers Friedrich Hofmeister (Leipzig), he has edited a number of musical works by W.A. Mozart (1756-1791), F. Nietzsche (1844-1900), Jan Brandts-Buys (1868-1933) and Julius Röntgen (1855-1932). His own piano composition "Memories" has been issued by the same publishers. Michael van Krücker received his first piano lessons from Prof. Ferdinand Bruckmann. After that, he studied music at the conservatories of Düsseldorf and Rotterdam, from which he graduated with distinction. He received further valuable artistic impulses and suggestions, among other renowned pianists, from Bruno Canino (chamber music), Irina Zaritskaya and Daniel Wayenberg, a student of Marguerite Long. Michael van Krücker is synaesthete and experiences music as a combination of sounds with colors.